In this computer age, Rodrigue Studio retains detailed records of art purchases, occasionally borrowing paintings from collectors for public exhibition. However, prior to the late 1990s, records were partial, hand-kept and often lost. People move, and paintings sell or pass to descendants. Some works exchange hands through private sale, and unless the art appears at public auction or the owner contacts us for appraisal, the whereabouts of many Rodrigue Cajun paintings remains, still today, a mystery. Until recently, such was the case with George Rodrigue’s Festivals Acadiens 1983 (oil on canvas, 40x30 inches). 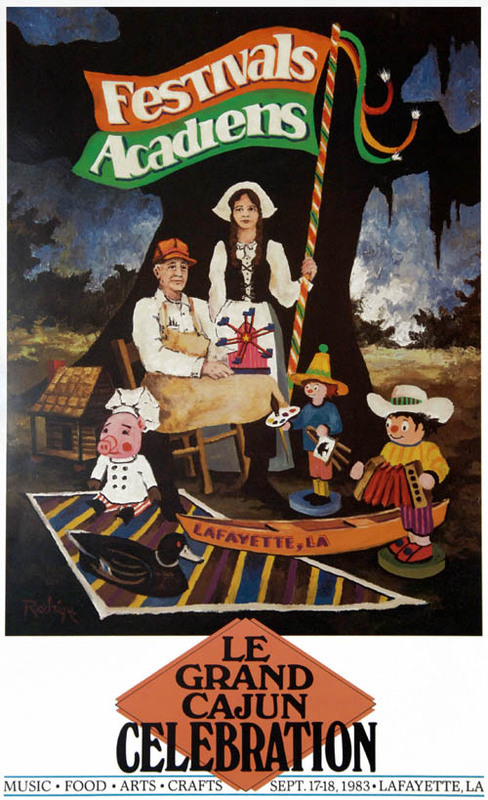 “Festivals Acadiens was conceived in the 1970s by Jimmy Domengeaux of CODOFIL and held annually in Girard Park. He showcased the Cajun lifestyle, mainly to share with visiting French teachers and dignitaries the resurgence of French culture in south Louisiana. “I painted my first Festivals Acadiens poster in 1981 and included samples of the various crafts, activities, food and music spotlighted within the festival." “Soon after, I traveled to Germany with my then-agent, Kurt Schoen, visiting European artists. I stumbled on a German wood-carving shop with figurines highlighting various subject matter, from religious iconography to common hobbies. They reminded me of the variety of interests within the Cajun culture. “I invented the carved Cajun musician with accordion, representing music, as well as the small wooden pirogue, duck decoy, and camp or cabin, referencing fishing, hunting and the swamps. “This unusual cast of objects and characters gathers on and around a quilted blanket, part of the weaving exhibition. 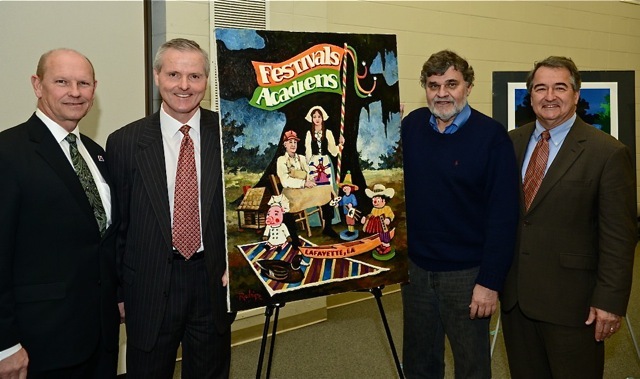 Today our archives includes a small stack of festival posters; however, the location of the painting itself remained a mystery for three decades until two months ago when Janet Wood, retiring after thirty years at Capital One Bank, contacted us regarding the original work hanging, since her first year in banking, within her Lafayette office. She encouraged Capital One to use the painting to further their philanthropic efforts in Acadiana. “What can we expect at auction?,” she asked. But George and I barely heard her, as we grasped the possibilities surrounding this discovered buried treasure. We shared with Janet the mission and programs of the George Rodrigue Foundation of the Arts (GRFA). Would she accept a Blue Dog painting in exchange, George asked, donating the 1983 Festivals Acadiens to our foundation? 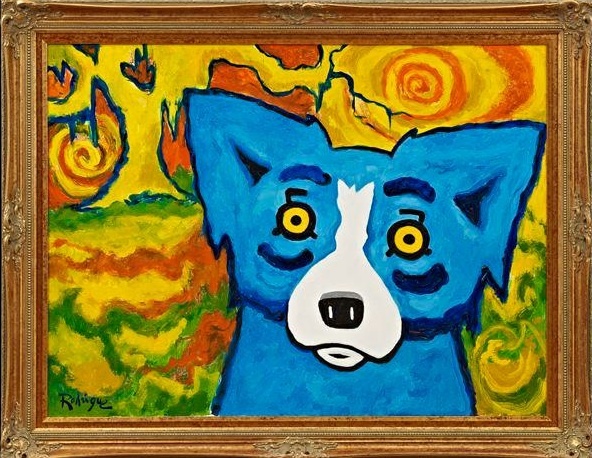 The Blue Dogs have a proven track record at auction, considerably higher than Rodrigue’s Cajun works. 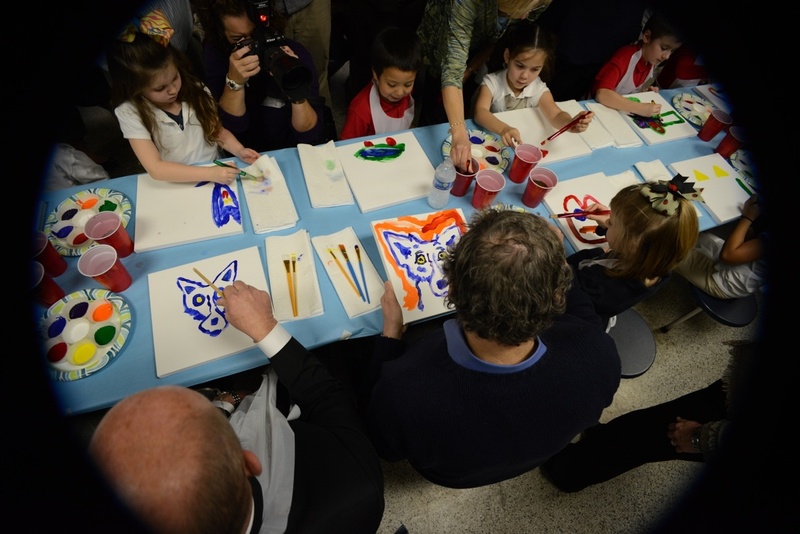 Capital One, encouraged by Wood, agreed to the trade, offered the Blue Dog at auction, and in a truly magnanimous gesture, donates those proceeds back to the George Rodrigue Foundation of the Arts for the benefit of art supplies and programs in Acadiana schools. 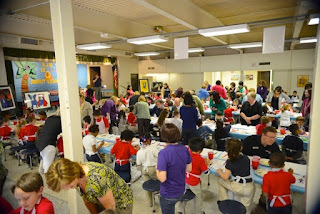 We expanded this transaction into a partnership almost immediately, launching our first joint-project with Capital One at SJ Montgomery School in Lafayette, Louisiana last week, where George, Parish President Joey Durel, the GRFA staff, and representatives from Capital One painted with students and distributed art supplies. “Capital One Bank is committed to Investing for Good in Acadiana. Throughout the year, we support programs and initiatives that benefit our local schools and students, because we believe that a quality education is the most important determinant of future success for children. This dynamic exchange, as I mentioned at the start of this essay, occurred because a lost painting came to light, first through Janet Wood’s initiative, then through the vision and generosity of Capital One, and finally through Louisiana’s growing enthusiasm for the arts in education, as championed by the George Rodrigue Foundation of the Arts. 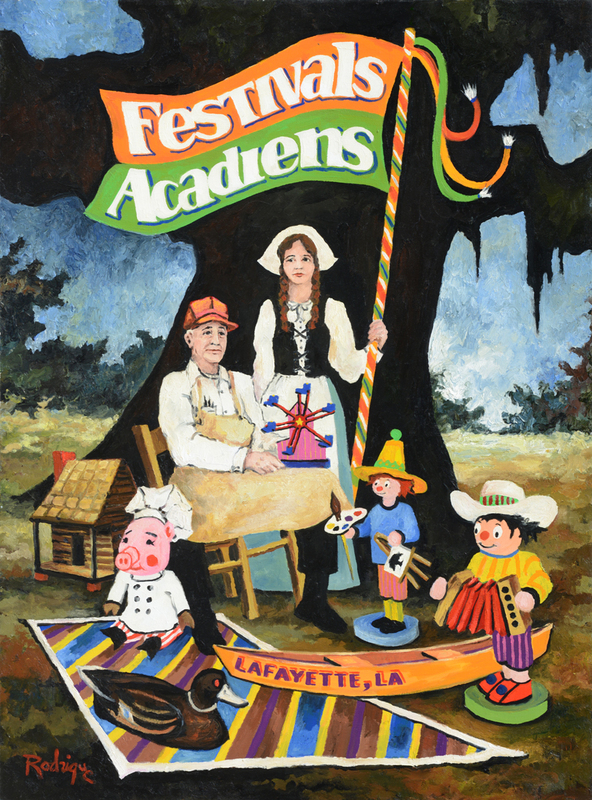 On the thirtieth anniversary of its creation, the formerly lost Festivals Acadiens 1983 now hangs in the GRFA Education Center at 747 Magazine Street in New Orleans, where it awaits wonderful adventures on tour. 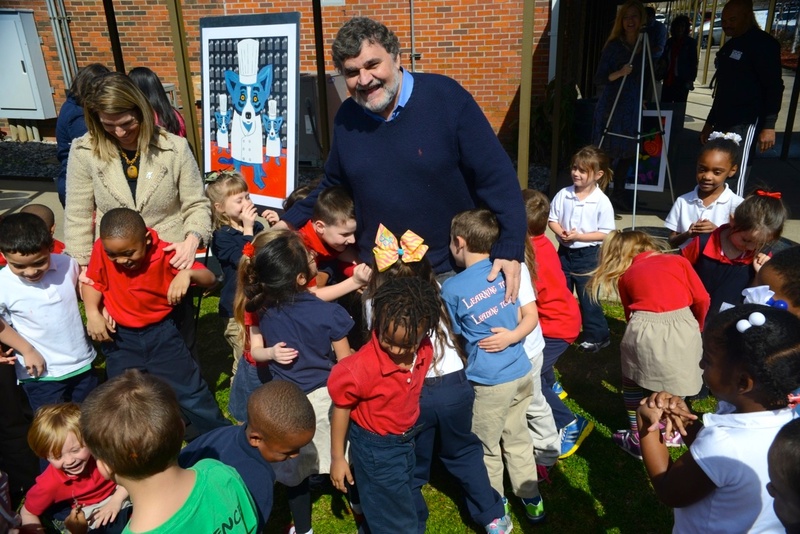 In effect, Capital One returned this painting not to George Rodrigue, but to the people of Louisiana. 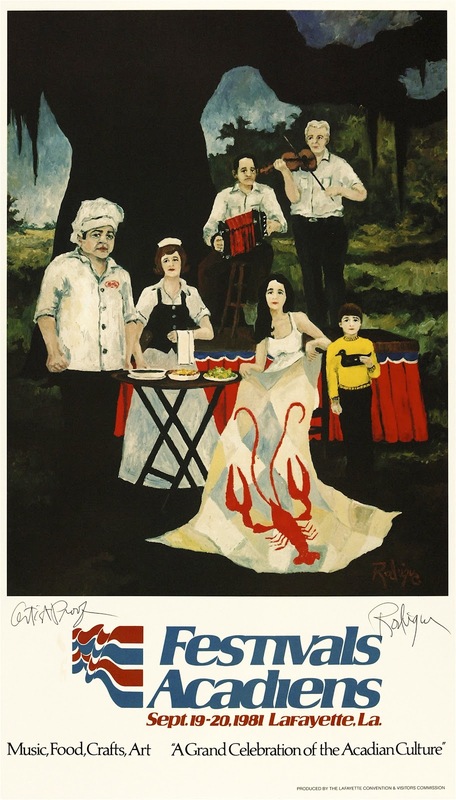 Whether on view at their local museum or representing the Cajun culture elsewhere, this special painting embodies the unique traditions of Acadiana, while representing the educational possibilities spawned by an exciting new partnership. The exuberance spilled out across the state on this past Wednesday in an eye-popping, hilarious photo in The Advocate--which now reaches into New Orleans. There were George Rodrigue and Parish President Joey Durel showing off their renditions of the Blue Dog--and the latter showing off why he will never quit his day job. The generosity of the Foundation doesn't just bring education: it brings excitement. That's how it brings memories. You are so right, Patty--- and as much excitement for the adults (including Durel and Rodrigue) as for the kids! This was truly a remarkable partnership and I am so proud of the outcome. While my banking career was filled with wonderful experiences, this was truly a highlight! You're the best, Janet. And I can HONESTLY state, it wouldn't have happened without you! 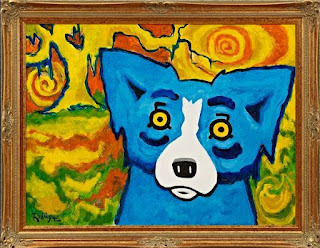 The Blue Dog painting, by the way, brought nearly $100,000 today at auction, all for the arts in education in Louisiana. Bravo and Happy Retirement! That's fantastic news Wendy - the icing on the sweet cake! Hi Storie- That is very thoughtful of you. If the owner wants to send us a photo of the front and back, along with any details, we are always interested in updating our database. By email info@georgerodrigue.com or by mail- P.O. Box 51227, Lafayette, LA 70505.